The Ruger factory manual, while good, is only helpful to a point for those wishing to know more about their pistol. We believe this manual is much better and easier to use for it lies open and flat when you lay it down. The last thing you need to do when working on your pistol is to try and hold a manual open to the desired page. 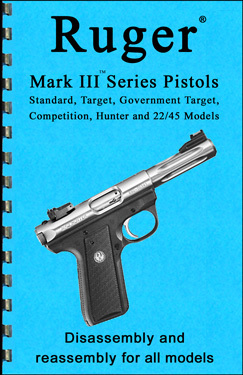 The information in this manual is specifically for the Ruger Mark III pistols (Standard, Target, Government Target, Competition, Hunter, and 22/45 models). Manual is 19 pages long and contains 36 high-resolution grayscale images (above are two actual pages from the manual). 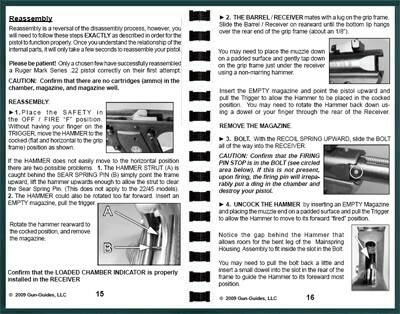 The manual gives the history of the pistol, operational information, disassembly instructions (further than the factory manual does) and reassembly instructions. It also contains a section on accessories for the pistol (just about all of them you can buy from Rimfire Sports) and complete serial numbers from 2004 � 2008. Printed in the USA with card stock cover and bright white paper. This is a must have for Mark III and 22/45 owners. Very helpful, the pictures are clear and the instructions are easy to read. Thank you from e putting it together.